Education. In the first college I attended I majored in history but didn't graduate. The second is very uninteristing so I'm pretending I'm not going there. I taught myself many things, among them some software. I've changed some dozen jobs, last one I did was writing news and editing articles at a web portal. Languages. I know several at mediocre level. English I never seem to stop learning, Spanish I quite forgot, some Turkish, several hundred Japanese words and grammar rules, weak Georgian, two dozen Mongolian words and very basic Chinese. Dreaming of Arabic, too. Look at the above picture to get an idea about how I look. There's a few more in the album... Do you get that Georgian streak in my features? Some say they do. When every day and every hour something happens, when every day it's the first time something happened to you, it's really hard to quit. You give up dreaming because all your dreams come true too soon. Dream of something in the morning and you'll get it by lunchtime. There's a whole philosophy behind -- it's a long story and I'll talk about it somewhere else. When I made this site all I wanted was a guestbook for quick communication. Later I added travel reports, and then when I had free time I gradually uploaded the rest. Driven by the energy of curiosity, I registered at www.couchsurfing.com. Interested readers may join in now. Other interests. I studied history and it affected me greatly. In a book by Mikhail Veller somebody says that historians develop ironical attitude towards reality, but that's a common delusion of those who are not historians. Most of the time it's the other way round. Maybe someday I will write historical novels -- somebody's supposed to do it anyway but nobody is doing it properly now. I made several attempts five or six years ago, but not very successful. History is extremely heavily contaminated with politics and really is all about modernity. On a special page (only in Russian) I've summed up my view of various moments in Russian and world history. You can argue with me if you like. May 1993. 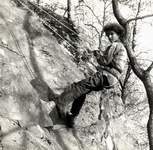 Rock-climbing near St. Pete. 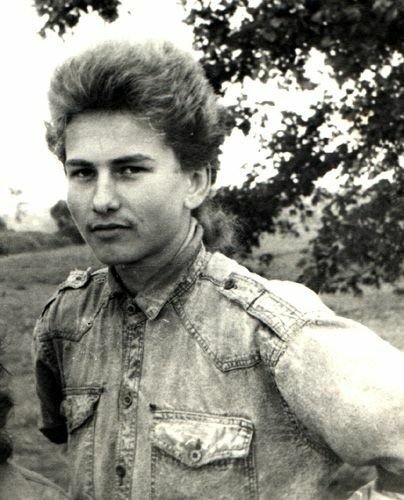 1994 in Bogolyubovo. I looked like this then. Books. Some people like telling what books they like to read. I tend to be indifferent towards fiction, my historical education taught me to favour specialised literature. Thus, I read for information rather than for entertainment. Fashion goes past me without stopping. Among classical things, I like Dostoyevsky but stay unmoved by Tolstoy. I think Alexander Grin is the one to learn how to write from. I respect Mikhail Prishvin for descriptions, Ernest Hemingway for his philosophy. Fond of Herman Melville, too. But I'm not really excited about fine writing; I'm rather curious to study the structure of the text, so I can really read anything, even about Tarzan or Harry Potter, though I feel revolted observing Ms. Rawlings' painstaking efforts to do what she can't do. So I've never made my way through more than ten pages. 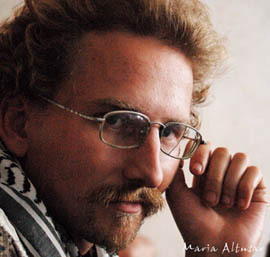 Страница сформирована за 0.020195007324219 сек.